Built for Orbital Imaging Corporation (ORBIMAGE), an Orbital affiliate, OrbView-4 will be one of the first commercial satellites to supply high-resolution imagery of the Earth. The OrbView-4 satellite carries a camera that will take one-meter resolution panchromatic (black-and-white) and four-meter resolution multispectral (color and infrared) images of the entire planet. The camera also includes a special component that will observe 200 channels of eight-meter hyperspectral data to identify material types on the Earth's surface. This hyperspectral sensor was developed for the U.S. Air Force Research Laboratory's Warfighter-1 program, an effort to provide military commanders in the field with quick-response surveillance information. The OrbView-4 satellite will revisit locations in less than three days. Anchor customers will be able to downlink imagery directly from the satellite, order imagery from ORBIMAGE's online service www.orbimage.com or purchase products from regional distributors. 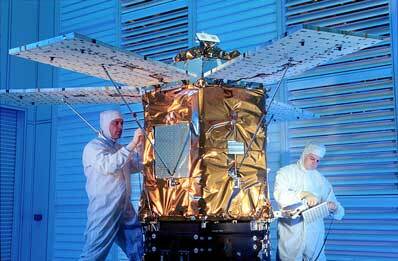 OrbView-4 is a high-performance, next-generation spacecraft designed, built and launched by Orbital. Its unique hexagonal configuration optimizes its in-orbit agility and camera function. Electronics are attached to the inside of the six panels surrounding the camera, a compact "wrap" that allows the spacecraft to quickly slew to targets and collect requested images. Also, star trackers and fiber-optic gyro sensors are mounted directly to the camera body, increasing the precision of the imaging sensors. ORBIMAGE's satellite control center in Dulles, Virginia, will provide full telemetry, tracking and command of the spacecraft, as well as data archiving and distribution services. Additional communications capability will be provided through the Warfighter mobile ground station, which was developed and integrated by Orbital. Imagery from the OrbView-4 satellite will complement existing geographic information system (GIS) data for commercial, environmental and national security customers. One-meter panchromatic imagery will clearly depict houses, automobiles and aircraft, and will make it possible to create precise digital maps and three-dimensional fly-through scenarios. Four-meter multispectral imagery will help to characterize cities, rural areas and undeveloped land. Eight-meter hyperspectral imagery will detect ground targets and conditions (e.g., camouflage) that will aid in U.S. military operations. It will also prove beneficial in agriculture, forestry, mineral exploration and environmental monitoring.